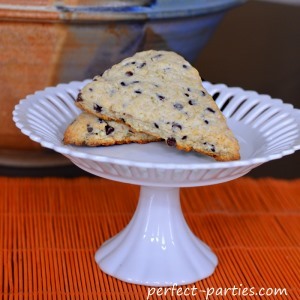 Scones are easy to make and perfect for breakfast or brunch! Hosting a tea party? This is perfect to serve with some lemonade in tea cups. I love how versatile this recipe is. Just add your favoriteingredient. Here are some suggestions we found. Add chocolate or butterscotch chips, dried cranberries, grated cheese, craisins and white chips, lemon zest and orange flavored craisins, hazelnuts and toffee chunks, walnuts and chopped dried apricots, coarsely chopped candied ginger and cinnamon, pecans and Kraftmaid caramels cut into fourths. If you have a favorite ingredient you'd like to share, please comment below! 1/2 cup chocolate chips or raisins. See our list of other suggestions! In a medium bowl, mix flour, 1/3 cup sugar, baking powder, baking soda and salt. 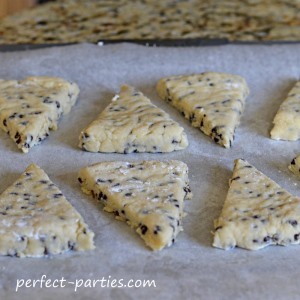 Grate butter into flour mixture on the large holes of a grater; use your fingers to work in butter (mixture should resemble coarse meal), then stir in chocolate chips or ingredient of your choice. 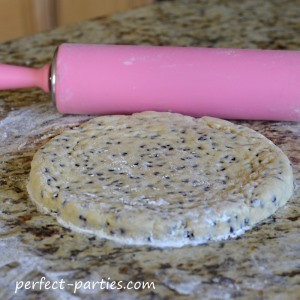 Place on a lightly floured surface and pat into a 7 to 8 inch circle about 3/4-inch thick. Sprinkle with remaining 1 tsp. of sugar. Use a sharp knife to cut into 8 triangles; place on a cookie sheet (preferably lined with parchment paper), about 1 inch apart. Bake until golden, about 15 to 17 minutes. Cool for 5 minutes and serve warm or at room temperature. Many people enjoy scones are best at room temperature but we like it warm with a pat of butter. Store extra scones, by wrapping in plastic wrap once cool. Store in the refrigerator for up to one day or frozen for up to 3 months. If frozen, allow to thaw in its packaging and warm in a 350 degree oven for 5 minutes before serving. 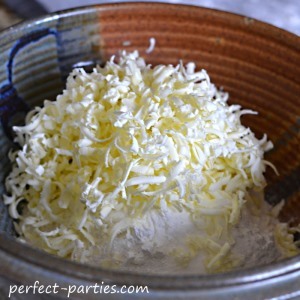 For a faster way to mix ingredients, use a food processor. Just mix the dry ingredients and frozen butter (cut in pieces) in a processor for a few seconds until well blended, add wet ingredients and pulse until well blended, add raisins or any other fruits or chips you like, just pulse it a couple of times to mix, take the batter out, pat or roll it flat and cut your scones. The batter needs to be well mixed but do not over mix and try to get it smooth – scones are supposed to look crumbly.